You really have got something to parade about and celebrate on March 17th. Your little one has arrived, albeit a bit early, but nevertheless here in the world with you. 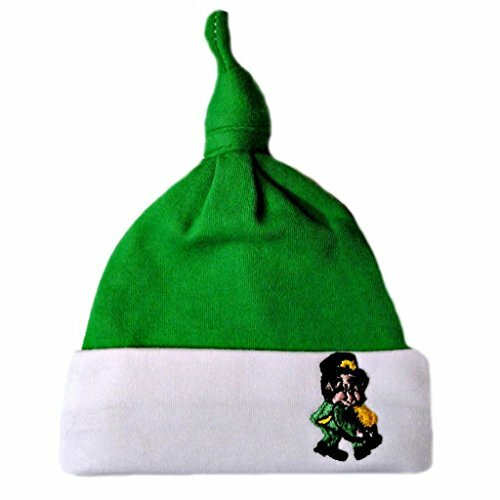 The problem is finding outfits that are appropriately Irish for such a tiny newborn. But help is at hand! There is an array of wonderful costumes for premature babies on St Patrick's Day. Your precious infant will certainly be wearing the green with aplomb, and a great deal of cuteness. Check these outfits out! The top name in premature baby clothes for the holidays is Jacqui's Preemie Pride. Suzanne Regan named it after her own tiny daughter. When we think of the little folk on St Patrick's Day, most of us picture a leprechaun. But not Suzanne and Ralph Regan. They have your tiny bundle of joy in mind, because they were once in your position. Their daughter Jacqui was born prematurely to a world of tubes and incubators. It all seemed so horribly impersonal, unnecessarily harsh during a very stressful time. As a talented dressmaker, Suzanne knew that things would appear so much better, if her little daughter was only in proper baby clothes. The wraps of fabric just weren't right. But most stores didn't stock any cute items small enough. Suzanne made her own baby clothes. As a mother, she knew that the material had to be soft, and able to be opened frequently without disturbing her baby. She made beautiful, wonderful things for her little Jacqui, which made her feel like she was doing something to help as well. It worked. There was no longer a vulnerable mite in that incubator. Jacqui blossomed as a baby, a blessing, a beautiful daughter. Jacqui Regan is an adult now. Married with children of her own. But her parents are still making the premature baby attire, providing joy and love for those following in their footsteps. 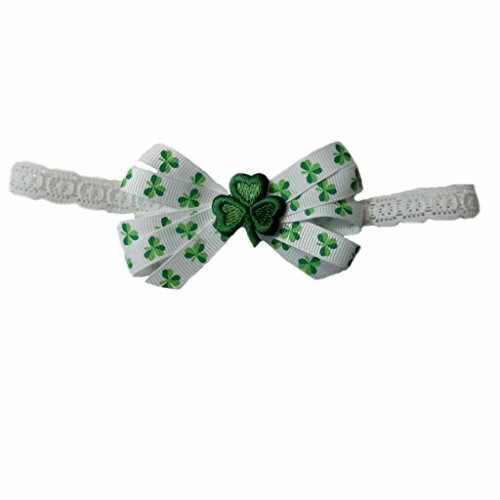 They have St Patrick's Day preemie clothes, so that your little one can wear the green this holiday and carry the luck of the Irish with them. 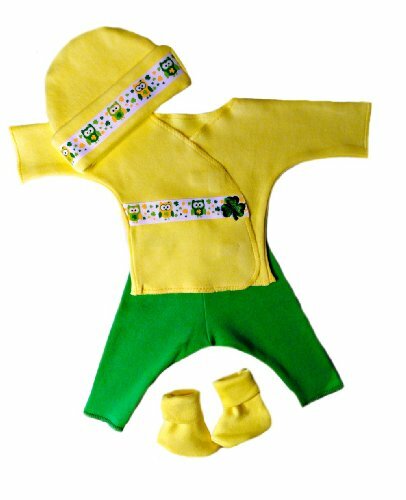 This soft knit leprechaun outfit for premature babies will look adorable on your little one. It's gentle enough on the skin to not cause any worries. All of the Jacqui's Preemie Pride range have been created with reference to NICU guidelines. 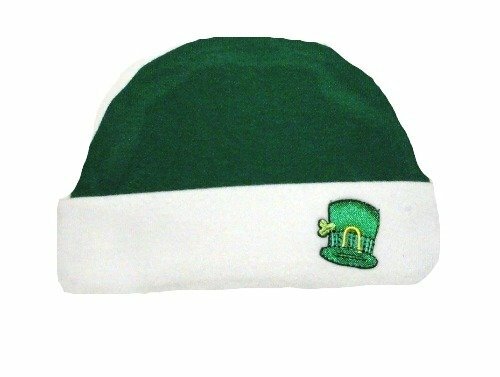 The costume features leaping shamrocks and leprechaun hats to make it perfectly right for St Patrick's Day. It fits babies from 0 - 12 pounds. I love this one! If you can't make out the detail, there's a row of green owls rocking a leprechaun hat. The legend repeats the words, 'Kiss me, I'm Irish', and why not?! 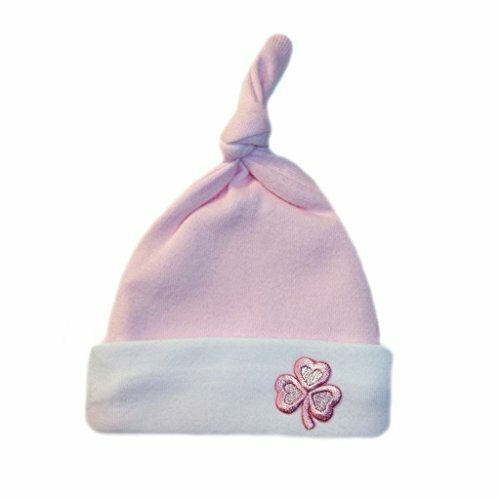 It comes in four sizes, ranging from the micro-newborn outfit at 0-3 pounds, through to newborn at 12 pounds (or 3 months). The design is pretty similar throughout this range. That's because there's only so many ways you can dress a premature baby, while allowing all of the access needful for medical examinations in an incubator. Both top and waist fasten with velcro for minimum disturbance of your baby's sleeping. We can all do with a little luck of the Irish at times. This cute outfit is tastefully brimming with it. 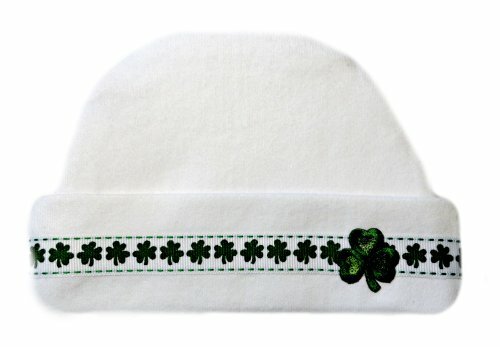 Four leaf shamrocks line the hat and waist, and we all know how they bring good fortune! Here in Europe, I doubt that anyone ever looks at a patch of clover - let alone shamrock! - without quickly scanning them for the elusive four leaves. I've only ever found one in my life. The rest remain resolutely three-leaved. 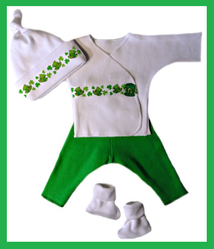 Nevertheless, the preemie baby St Patrick's outfit has them in abundance. 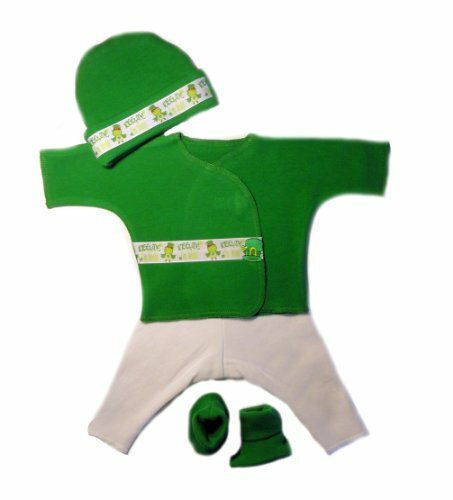 There's been a big assumption here that you want to clothe your baby in green, just because it's St Patrick's Day. But you can be Irish every other day of the year too. 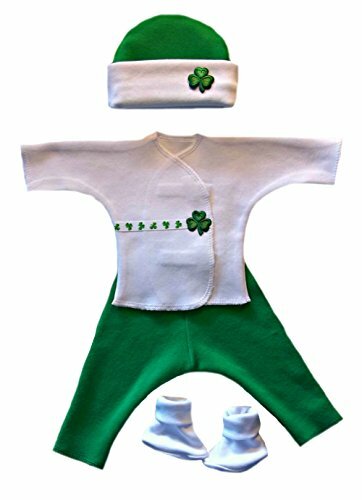 This is a premature baby outfit for Irish girls, unless you want to disdain that whole color/gender thing and rebelliously put your Irish boy in it instead. I'll cheer you on! It's pink and covered in shamrocks. That sounds Irish enough to me! 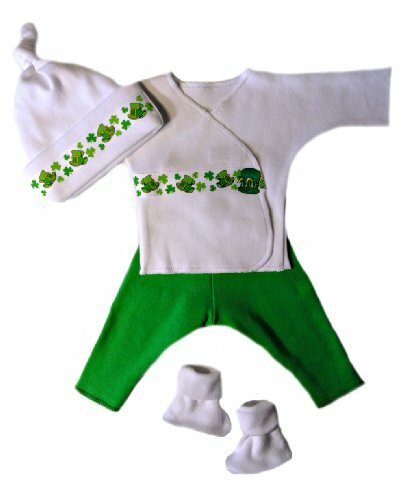 This is another outfit for preemie babies that's as good any other day of the year, as it is on St Patrick's Day. The row of adorably cute owls all have shamrocks on their midriff. They're lined up against a backdrop of tiny shamrocks too. Irish enough for the holidays, but ready for repeated wear the rest of the time too. 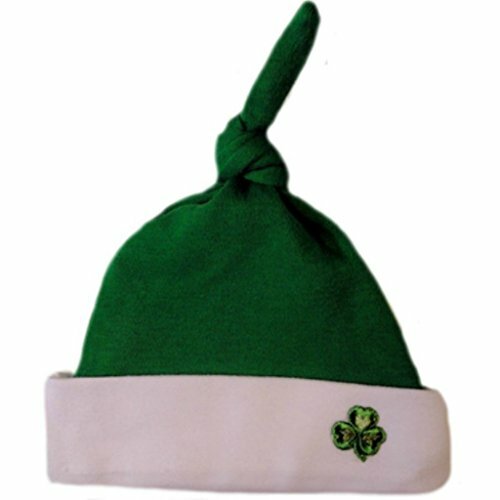 You might not want to go for the whole costume, but your wee newborn could still wear the green on their heads! Apparently your little one wanted to be here for the festival! Now you just have to find a preemie Halloween costume to fit a tiny newborn. Let us help out here. Cute... cute! Added to my Irish Pinterest page. Those are lovely because they don't just say 'St Patrick's Day'. They say 'Irish' per se. 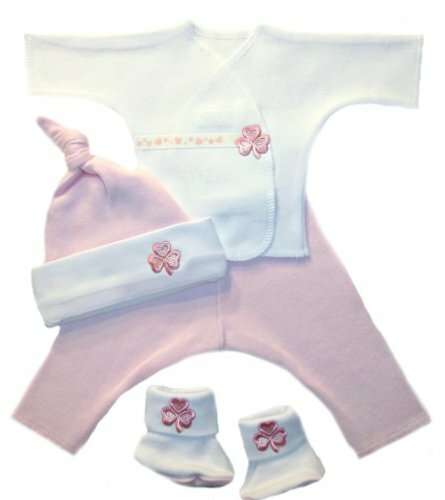 These are gorgeous outfits for babies. I especially liked the green and yellow ones. Aren't they? I enjoyed writing this one. It looks like we're all having cute attacks over these! Beautiful clothes though, well deserving our awwwwing.